BUT prosperity for whom? The locals or outside traders? The teams are on their way back to the south part of the study area where they will do a thorough exploration and animal inventory. 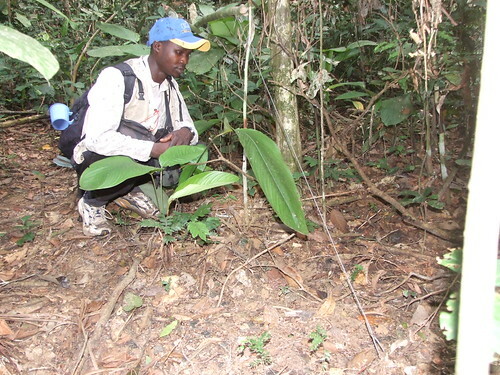 This is why: the first transects in this area (Dec 2007) revealed many bonobo, but also massive hunting for the bushmeat trade. We now need excellent information about the entire southern area to be able to lobby for protection of the most important forest as a viable home for bonobo and other animals. Do you see the metal snare line? The forest antelope won’t. 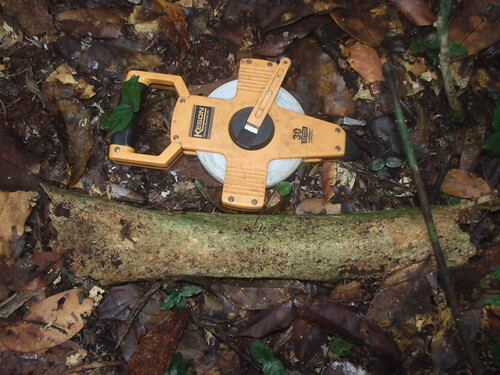 Even in the most distant forest there were snare traps. There were frequent signs of past elephant hunting, but there is almost no sign of recent elephant activity. Elephant bone in forest duff. The same fate will quickly follow for other animals if something is not done. Dino’s teams made a forest bushwack from the Lomami to the Lualaba. A key river and tributary of the Lualaba is the Kasuku or Parrot River. 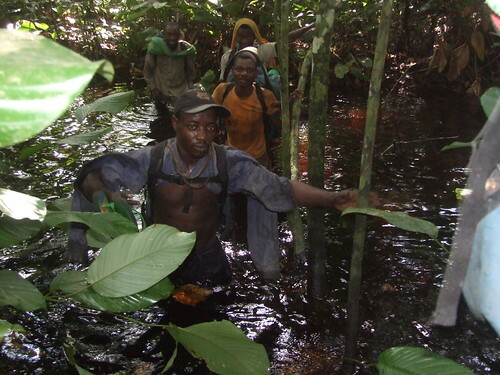 The Kasuku’s tributaries are deep and dark and the forests in its basin are home to many bonobo. 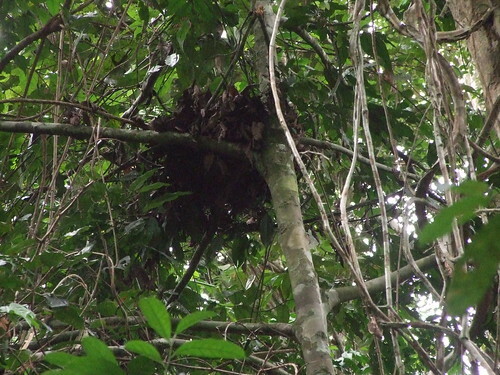 One of many bonobo nests. Once on the other side of the Kasuku there were numerous settlements and, most disturbing, numerous traders in bushmeat. 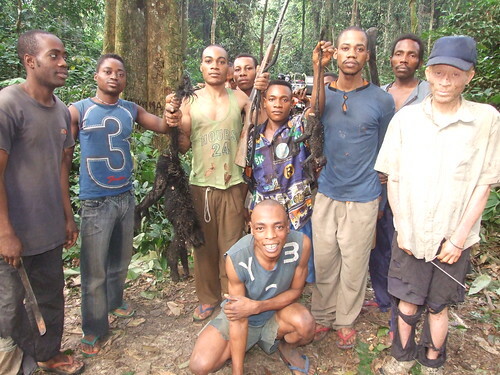 These are bushmeat buyers. They are not local. One is from Kasai, the other from Kindu. This is not a trade that brings much profit to the local Balanga population , but they will end up with an empty forest. 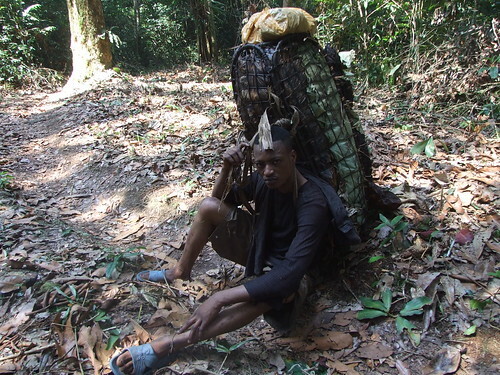 Nevertheless, with few other options, they are hired as hunters and transporters. Even the old transport bushmeat to earn some cash. And the young transport huge packs of dried bushmeat. 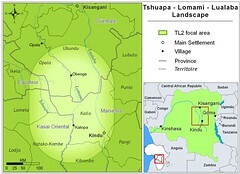 Oxfam is building a road through nearly uninhabited forest to connect the Lualaba and the Lomami. If it is finished, it will make it much easier to “empty” the forest. Contact Oxfam here to object to the Maniema road; build schools instead and give scholarships to children to attend them. This local boy carries bushmeat to market for one of the road workers that Oxfam brought in from the distant Province of Kivu. The local Balanga hired to work on the Oxfam road, mind snare lines and hunt with “calibre 12” in the afternoon. Road workers with a black mangabey, its young and the 12 caliber rifle that killed it. Will the average Balanga family benefit from this road or will their resources be exploited by others and they, themselves be left with empty forest, no schools and no opportunities. Dino was struck by the fact that the Balanga were so poor in the work camps where they stopped, that they had neither plates nor bowls. They ate out of leaf lined holes dug in the ground. 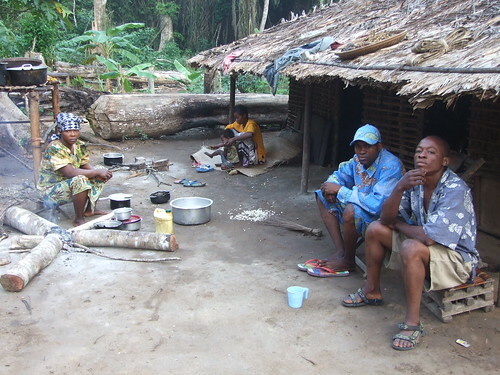 Dino’s team sets up for the night in a road-workers camp where bushmeat is being smoked. Couldn’t the same money be used to build elementary and secondary schools on the east side of the Kasuku? Couldn’t the money be used to pay teachers’ salaries? Couldn’t small scholarships be given to young Balanga from the west side of the Kasuku, from near the Lomami, to come to the schools and stay in simple dormitories. Here they could learn the basics necessary to control their fate and the fate of their forest in a changing world. UPDATE FEBRUARY 2009: Erwin Brouwer of OXFAM-Novib and I finally met up in Kindu and had a chance to sit down over a beer on the shores of the Lualaba. We actually agreed, even enthusiastically, about what was appropriate and useful development. Talking with OXFAM-Novib’s partner in Kindu we all decided that suspension of the road was necessary, but that other humanitarian interventions were possible and even critical for the often very isolated Balanga villages. 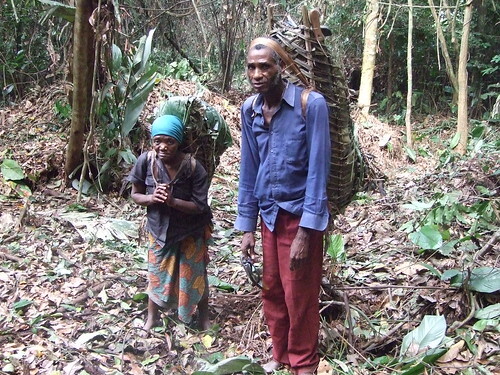 Hunters Pull Back from Lomami’s Bonobo Forests. This entry was written by Terese Hart, posted on 2008-09-17 at 6:50 pm, filed under Bonobo, Bushmeat, Elephant. Bookmark the permalink. Follow any comments here with the RSS feed for this post. Post a comment or leave a trackback: Trackback URL. Terese, you should attend the weekly Ocha meetings in Kinshasa and present yourself to the humanitarians working in DRC. Oxfam is surely present there too. Ask Lina to invite you along. Homo sapiens = protein-ravenous primate? Possibly a stupid question, but what is the protein alternative for the Congolese but bushmeat? good suggestion, Kim and Germain suggests same for us in Kindu. 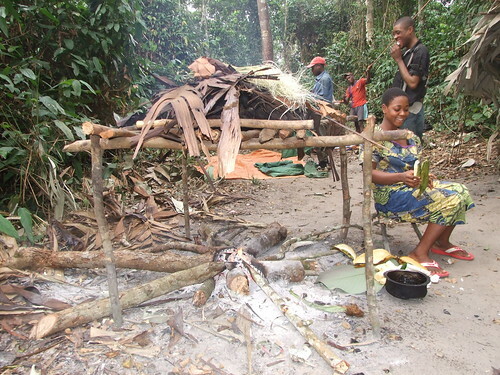 In fact where faunas have been depleted, dietary transitions happen…They have to, people have no choice, and they turn to fish, domestic meat, beans…..Bushmeat may still remain a luxury commodity, long after it is no longer a staple. In fact only a small fraction of bushmeat use is as a staple now…It remains a staple for the Mbuti pygmies, mainly, a few other hunters. But where it is a staple it is low volume, regular commodity in the diet. And the Mbuti are not killing apes. The animal protein that is easily raised and in almost every village is Goat and Chicken. Goats are not frequently eaten…more often used for bride wealth and arbitration BUT could be. Vegetable protein is beans — not popular everywhere. 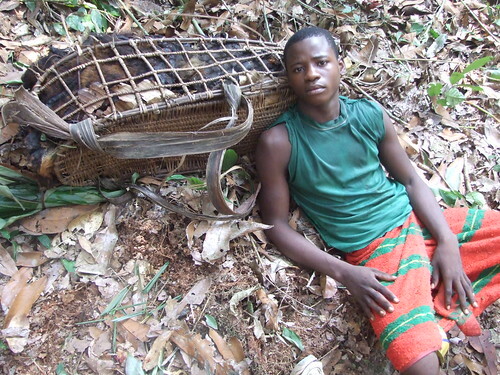 AND our objection is not that the local villagers eat bushmeat…our objection is the massive export of bushmeat towards outside urban centers. Here not only are goat and chickens possible but frequently pigs and even cattle are raised or brought in. if, would this improve the situation? Hmmm, important and difficult question. What could be worth the long transport to market other than bushmeat or minerals? Both subject to exploitation by outsiders. But what could convince a village to move closer to health care and education leaving their ethnic home and forest lands? A central question and all ideas very welcome!! wise, excellent idea the schools – but when have the deep pocketed folks ever put education first?